ANN ARBOR–Your knees and your smartphone battery have some surprisingly similar needs, a University of Michigan professor has discovered, and that new insight has led to a “structural battery” prototype that incorporates a cartilage-like material to make the batteries highly durable and easy to shape. The idea behind structural batteries is to store energy in structural components–the wing of a drone or the bumper of an electric vehicle, for example. They’ve been a long-term goal for researchers and industry because they could reduce weight and extend range. But structural batteries have so far been heavy, short-lived or unsafe. To sidestep these trade-offs, the researchers used zinc–a legitimate structural material–and branched nanofibers that resemble the collagen fibers of cartilage. Dendrites are tendrils of metal that pierce the separator between the electrodes and create a fast lane for electrons, shorting the circuit and potentially causing a fire. Zinc has previously been overlooked for rechargeable batteries because it tends to short out after just a few charge/discharge cycles. Not only can the membranes made by Kotov’s team ferry zinc ions between the electrodes, they can also stop zinc’s piercing dendrites. Like cartilage, the membranes are composed of ultrastrong nanofibers interwoven with a softer ion-friendly material. 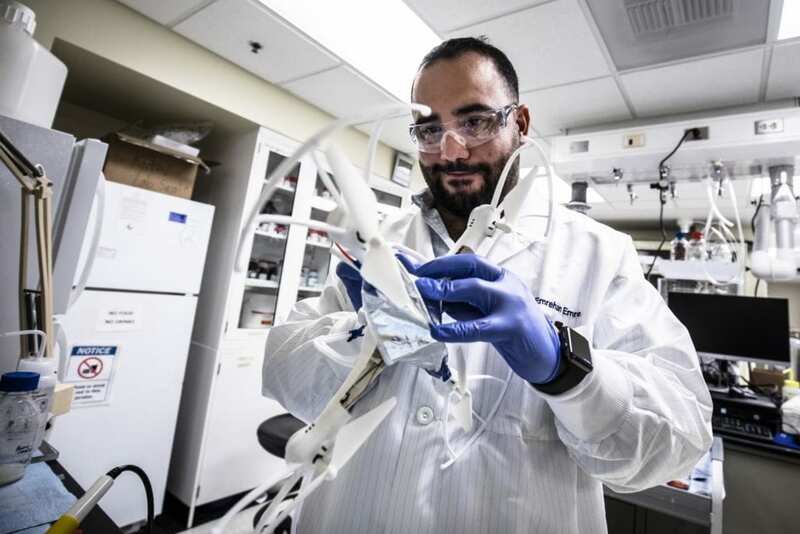 In the batteries, aramid nanofibers–the stuff in bulletproof vests–stand in for collagen, with polyethylene oxide (a chain-like, carbon-based molecule) and a zinc salt replacing soft components of cartilage. To make working cells, the team paired the zinc electrodes with manganese oxide–the combination found in standard alkaline batteries. But in the rechargeable batteries, the cartilage-like membrane replaces the standard separator and alkaline electrolyte. As secondary batteries on drones, the zinc cells can extend the flight time by 5 to 25 percent–depending on the battery size, mass of the drone and flight conditions. The research was supported by the Air Force Office of Scientific Research and National Science Foundation. Kotov teaches in the Department of Chemical Engineering. He is also a professor of materials science and engineering, and macromolecular science and engineering.